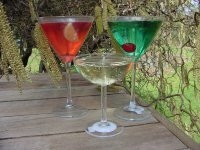 Wine glasses, beer mugs, martinis and margaritas - all non-alcoholic, long-lasting scented candles! Looks like a cool glass of beer - it's a gel candle, topped with a layer of our soy candle! Vanilla scented. These are a beautiful addition to any special occasion. The price is per candle. We added a bug repellent to this clever little candle, making it perfect to use on the patio this summer! Lovely for your table! Cranberry scented. Also available in White Wine, or Unscented. Lovely for your table! Unscented. Also available in cranberry scent (see Red Wine candles).